Just about every type of datastore has some form of indexing. A typical relational database, such as MySQL or PostreSQL, can index fields for efficient querying. Most document databases, like MongoDB, contain indexing as well. Indexing in a relational database is almost always done for one reason: speed. However, sometimes you need more than just speed, you need flexibility. That’s where Solr comes in. In this article, I want to outline how Solr can benefit your project’s indexing capabilities. I’ll start by introducing indexing and expand to show how Solr can be used within a Rails application. Indexing data is a very old concept. It far predates relational databases and computers entirely. Index cards have been used in a wide variety of situations, especially in library catalogs. Librarians index their books using a number of techniques, one of which is alphabetization. A simple index could be contrived by listing all the books that begin with A, then all the books that begin with B, and so on. When searching for a book, say “A Tale of Two Cities”, you look at the first letter of the title, “A”, and then jump directly to the “A” section in your library index. The purpose of indexing, no matter where it’s applied, always pertains to organizing data so it can be extracted quickly. You can imagine organizing the library catalog by genres, in which case “A Tale of Two Cities” might fall into “Fiction”. The librarian would then jump directly to the “Fiction” section. All production-ready relational database systems contain indices. Frequently you want to index by a foreign key so that querying for that foreign key can be done efficiently. This can dramatically increase performance when performing joins, for instance. Both MySQL and PostgreSQL support “full-text indexing” which allows you to query against a large block of text for bits and pieces contained therein. If you’re just looking to have a simple search box on your site, full-text indexing using your already-existing relational database might be the way to go. It has two major advantages: you’re working within the same tool and your indices are always up-to-date. It has one major drawback: it’s not flexible enough to handle “outside the box” indexing situations. If you stick to a relational database for all your searching needs, you’ll often find yourself creating awkward and inefficient queries. This is a good sign that you’ve reached the limits of what the database can provide. That’s where Solr comes in. It’s designed to augment your existing relational database and provide additional means of querying the data. Solr is a very mature technology, originally created in 2004 and used by Big Dogs like Netflix and the Internet Archive. 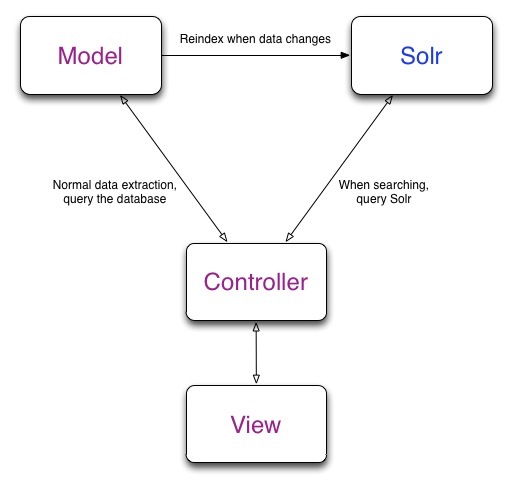 Built on Lucene, Solr provides you with a different way to define your indices. Effectively, Solr helps redefine your relational data into a more document-oriented structure efficient for querying. Sunspot is the king of integration between Ruby and Solr. It provides a clean DSL (Domain Specific Language) to define how you want your relational data indexed with Solr. Let’s contrive an example. This isn’t nearly flexible enough in most cases. What if we wanted a search for “cities” to also include “New York: A Big City”? This technique wouldn’t provide us with the results we desire. Let’s introduce Sunspot. At this point, you should be up and running with Solr. Let’s redefine our Product model. I won’t include validations again, I’ll just pretend they still exist. What we’ve done in the above model is tell Solr how we want it to index our Product model. We’ve told it to treat the name and color fields as text and the used field as a boolean. Defining something as “text” in Sunspot means that it’s full-text searchable. In other words, when you search against the name and color fields, it will find partial matches (ie a search for “bread” will return “bread and butter”). We’ve also told Sunspot that we want the name field to have twice (2.0) the prevalence as the color field. If a search brings up results by both name and color, the results matching against the name field will be more relevant. This search would return new copies of “A Tale of Two Cities” and any other books with “cities”. The search is case-insensitive by default. Searches can also contain ranges, date comparisons, set includes, greater than and less than queries, and more. As you can see from the model and search definition, Sunspot provides us with a clean and readable DSL. This is one of my favorite aspects of the library. StandardTokenizerFactory tokenizes our text. In other words, it breaks down our text field into its individual words. StandardFilterFactory provides Solr a means of searching the data by the tokenized text. LowerCaseFilterFactory converts all the tokenized words into their lowercase form. New filters can be appended to the end of this text field definition. The filters happen sequentially, so filters appended to the end of the list will cascade from the filters before it. We’ve now told Solr that we want to stem any text we index after it’s first been tokenized and then converted to lowercase. We have a problem, however. Not all stemmers are intelligent enough to replace the “ies” with a “y” in the case of stemming “cities”. In fact, this job is usually left to a lemmatizer. Stemmers and lemmatizers are both language specific. That is, stemming an English word is much different than stemming a Romanian word, for obvious reasons. If we tried to stem the word “cities”, what we would actually get is the word “citi”, which is clearly incorrect. Try stemming some different words on this online stemmer. It feels like we’ve hit a rough spot with Solr, and we truely have. Solr doesn’t have a lemmatizer built-in. We could write such a filter but it would be a painstaking task. Possibly, a better option is to use the SynonymFilterFactory. The above synonyms.txt file tells Solr that we would like to treat the word “citi” as though it is the word “city” and the word “copi” as “copy”. Solr is a phenomenal technology that provides powerful search capabilities. We’ve touched on some history behind indexing and the painpoints of relational database searching. We’ve also looked at how we can utilize Solr in a Rails app using Sunspot and dug deep into Solr configuration to show how to handle a tough edgecase. But we’ve only scratched the surface. One of the most powerful features of Solr is faceting, the concept of breaking apart your index into hierarchical chunks for which you can drill into to find relevant results. Usually, as you drill into a category (facet), more categories are exposed to show deeper layers of facets. Sunspot handles faceting with finesse. Newegg and Amazon both exhibit great uses of faceting when exploring categories on the left navigation. I hope this article has intrigued you by exposing some of the deeper features of Solr. There’s a lot to learn and taking it step-by-step is always the best approach. I encourage you to get comfortable with Solr so you can handle complex search queries with ease.